Bret and Owen Hart had a strained relationship at the end of 1993. The duo started showing problems while teaming with two other Hart brothers at the Survivor Series that year. Owen was the only member of the team to be eliminated, showing some signs of jealousy toward his brothers. It appeared by January 1994, Bret and Owen had patched up their differences over the holidays and were set to face the WWF Tag Team Champions The Quebecers at the Royal Rumble. There were points in the match when Owen kept the referee occupied and the heel champions beat up on Bret, attacking the former WWF champ's knee repeatedly. It's one of the subtle actions that foreshadowed what was to come. After the referee ended the match because of Bret's pain, Owen took out his anger by attacking his brother's vulnerable knee. Ted DiBiase was on commentary and talked about Bret hogging the limelight and not tagging in Owen. Owen repeated that sentiment as he walked back to the locker room. 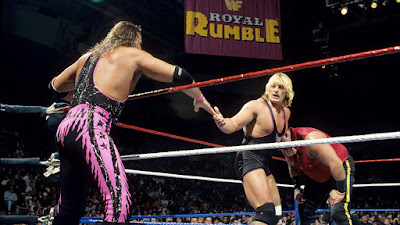 Bret hobbled out later in the evening and co-won the Rumble match along with Lex Luger. The actions of that night resulted in a great series of matches between the brothers, including Owen's huge pinfall victory over Bret at WrestleMania X. Later that night Bret regained the championship and defended it against Owen all summer, including inside a steel cage at SummerSlam 94. It's that feud that made Owen an upper tier Superstar. It wouldn't have been possible without this tag team championship match.